Whether you are interested in buying porcelain products or not, we certainly weren’t, as a backpacking overland trip to Tibet is hardly the ideal way of transporting a fragile vase, a visit to Jingdezhen is well worth it. 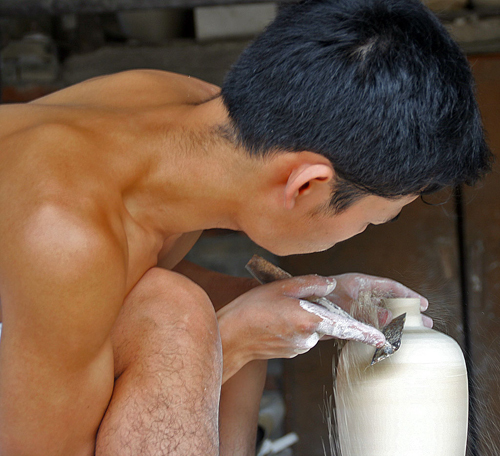 For one, it offers plenty of opportunities to see porcelain production from beginning to end. Without a doubt, the best place to start is at the Museum of Ceramic History and the Ancient Pottery Factory, a few kilometres out of town across the river. 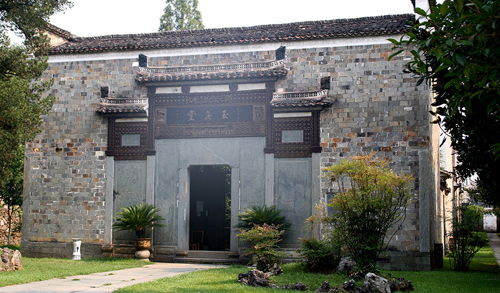 This place would be worth a visit just for the building alone: the Museum is located in a stunning Ming mansion, built in Huizhou style, with beautifully carved doorways and beams. For us, it rates as one of the most beautiful buildings we’ve seen in China, on a par with the Zigong Guildhall, and we’ve seen quite a few! The setting, all lush bamboo groves and tranquil, landscaped gardens adds to its charm. Walking around the site, you come past an artificial lake with a water-stage: if you are lucky you may catch a performance of classical Chinese music played on traditional instruments which, yes, you’ve guessed right, are all made of porcelain. In the Factory/ Workshop area, you can watch the artisans at work: shaping and moulding the wet clay, painting and glazing the semi-finished products, or setting them out on racks to dry. The techniques have hardly changed in centuries and, in fact, most of the workmen look as if they haven’t either. Some of the venerable gentlemen we spoke to said they had been working at the kiln for over 50 years. We are particularly impressed by the huge, two-storey kiln, which predates the Industrial Revolution. How could people stoke those mighty furnaces, incorporated into the half-timbered factory, without the building catching fire? To get there, you can take Bus 3 to its terminus, past the old, long-distance bus station. 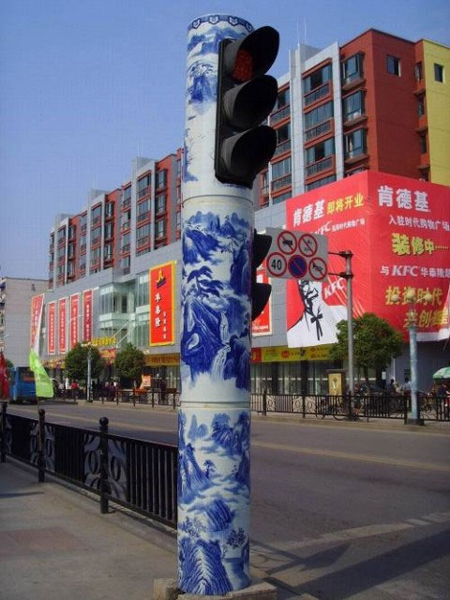 There are frequent buses to and from Nanchang – the capital of Jiangxi – which can take between 2 to 4 hours, depending on the road works. These buses will drop you at the new, long-distance bus station. 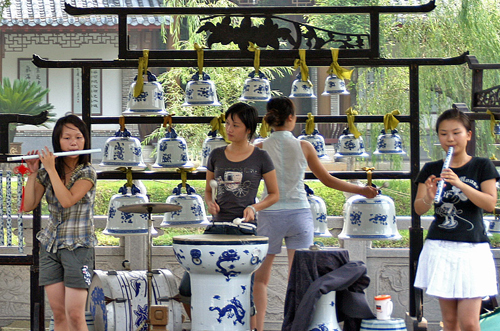 We visited Jingdezhen en route to the fabulous scenery and villages of Wuyuan. To get to Wuyuan, you need to go to the small eastern bus station from where regular buses take little more than an hour along a lovely, rural route. We stayed at the Jingdezhen Jinsheng Dajiudian. Rooms were standard but okay at 180 Yuan. The most important factor was that the air-conditioning worked; given that outside it was a stifling 38 degrees under a merciless sun. Food options in Jingdezhen were nothing to write home about. We were lucky to find a few stalls set up at an impromptu night market on the corner of Zhushan Lu and Zhonghua Beilu. More than the food, it was the availability of ice-cold-beer that saved the day. Whats up! I just want to give a huge thumbs up for the great info you’ve gotten here on this post. I just found your blog while planning my next China visit. Where can I read more about your visit to Wuyuan ?